Ardyth has a wonderful challenge happening on the One Layer Simplicity challenge blog this month. We have to use squares on our one layer cards. It can be one square or many squares; there are so many possibilities. I decided to mask and sponge my squares with a bit of a diagonal ombre thing happening. I taped around the edges of the large square with painters tape then cut two narrow strips and criss-crossed them in the middle. 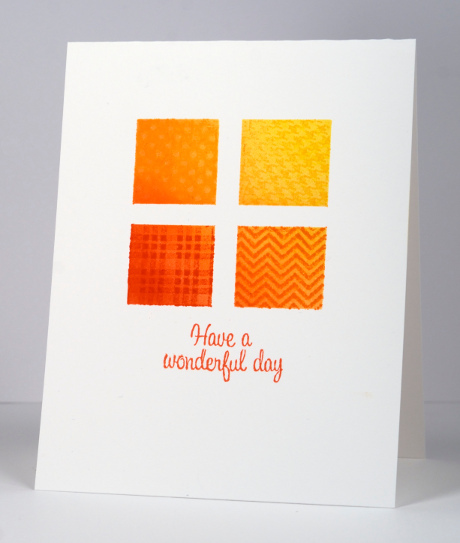 My sponging blends from yellow through orange to a burnt orange colour (listed below) and then I added a little pattern to each square by masking the other three squares and stamping. The patterns are from the transparent set, ‘Treemendous’ and they were perfect for this technique. I also used a sentiment from the same set which makes this a one layer, one stamp set and one colour scheme card, but that is not required for the challenge! The challenge is to have fun with squares on a one layer card. Hope you’re inspired. What a great CAS card – very clever masking. What perfect shading you achieved, Heather! Love the different subtle patterns you added, too. Totally hip. Love your sunny colours and neat technique! Three words: simple, shiny, georgous!